To be spiritual means to be connected to something divine, something that is more powerful than us, something that gives our lives meaning. Spirituality comes in many different ways so it’s different for every individual. There are those who see it as an all-mighty God who helps them through difficult times, and there are some who picture it as a bond with nature and the universe. To have such a relationship with a higher being can be very important, not only because it gives people comfort, but because it can also turn into a meaningful moral code or even a way of life. In general, Fire and Water signs show to be more spiritual than Air or Earth signs, the latter carrying more towards logic and practicality. 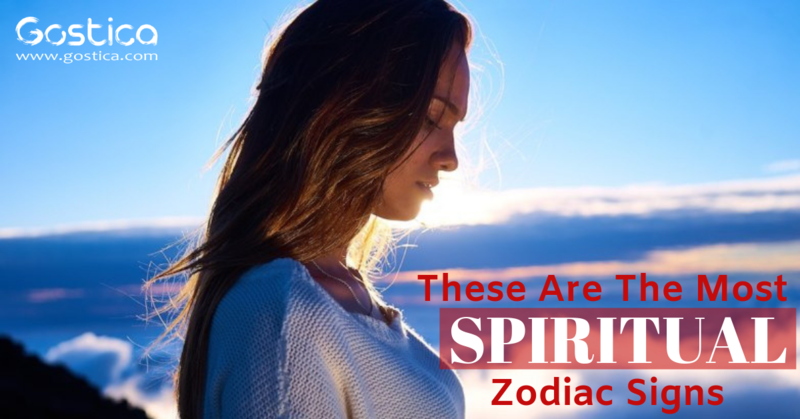 Out of all the signs in the zodiac, we have chosen a few that prove to be deeply connected to their inner selves and live a life of the mystical, sacred, and divine. Scorpio’s strongest traits are being influential and mysterious. This is a powerful sign that often rebels against the rules, but these individuals can also be very sensitive and emotional even though they hide it well. To a Scorpio, there’s nothing more powerful than knowing you’re not alone in this world and that someone will look after you while you’re out there fulfilling your self-given tasks. Scorpio’s understanding of the universe and everything in it is so deep that they often find themselves on the most unique spiritual missions of self-development and self-discovery. Because of their complicated nature, they constantly end up battling inner demons and the best way for them to get through is to focus their energy on a much larger picture than themselves. This Water sign believes that if you’re in touch with your spiritual side, you can accomplish anything. If there is one word that can describe a Sagittarius, it’s definitely this one – spiritual. They enjoy new discoveries and they are constantly on the lookout for more information about how they can get better. A Sagittarius never dismisses the possibility that the universe is controlled by all-powerful beings that may have created us in their own little laboratories and are watching over each and every one of us at all times. Sagittarians show respect towards all religions, sacred rituals, traditions, faith communities and so on. Basically, they are open to any kind of belief system that, in a way, makes sense to them. A Sagittarius goes through life with an unbeatable optimistic view and always sees the good in the things surrounding them, so, no matter what happens to them, they know that everything will be alright in the end. This is probably one of the most creative signs in the entire zodiac and, at the same time, one of the most spiritual. Pisces live in their own world of beautiful fantasies and mysticism, allowing themselves to wander around the universe and get in touch with all of its mysteries. They always focus on what’s hidden deep inside instead of just looking at things for what they appear to be. Water sign relates to their own thoughts and beliefs. Pisces knows that it’s all in the details, so they focus on all the small, simple joys in life that come by every day. Just like the other two Water signs, Cancer is incredibly sensitive and can often get hurt very easily, but there’s no doubt that their spiritual side makes them stand out. This is a sign whose nature shows nothing but kindness and generosity. They’re filled with love towards others and will do anything to help them through their difficulties without expecting the same in return. Cancer’s spirituality allows them to care for their closest in a special and unique way, and that’s exactly the reason why they’re loved. Still, they never get too carried away. Cancer knows that they can’t fully rely on God or the universe because there are some things that they have to take care of themselves. Spirituality in a Cancer is shown by their endless warmth and compassion when faced with tasks that challenge them emotionally and mentally. An Aquarian’s dominant features are originality and creativity. They are constantly full of ideas which are often unpredictable and they are one of the most open-minded signs in the zodiac. Aquarius can accept anything that gets thrown their way; from pagan Gods to invisible universal forces – anything is plausible and anything can hold potential to become their next, newest obsession. Once they make their spiritual choice, they will eventually question it, but that’s just how their mind work. This Air sign moves back and forth from complete certainty in the decision they’ve made to complete doubt in their entire belief system. Being extremely persistent, they will never quit their search for what’s “pure and true”. Even when it seems like they’ve already reached the end, a new, weirder idea will pop up and spark up an Aquarian’s interest once again. Leo is known for being the most egocentric sign in astrology, so it might sound weird that this Fire sign is picked between the most spiritual ones. However, it’s wrong to assume that all a Leo worries about is themselves. They are actually incredibly kind-hearted and they genuinely care about other people’s well-being. To them, being spiritual means growing and evolving into something greater, better, and wiser. Still, they never choose to lean on their beliefs entirely. Leos do their best in every field and work really hard to get ahead in life, relying mostly on themselves and their own abilities. Leo’s spiritual side comes alive when they battle emotional difficulties or when they’re faced with problems they can’t solve. Other than that, their spirituality is expressed in moments when they devote themselves to other human beings and in those rare occasions when they choose to put someone else before themselves. Namaste . Didn’t mention Aries ♈️!